Hey guys, I'm new here. I know this isn't the introduction page but i will tell a bit about myself anyway lol. I am 23 years old and live in Salt Lake City Utah, and am a receiving manager for a bookstore. I am currently going to school to study electronics engineering. I will be done with my degree in march.I have had a couple of parakeets for the majority of my life. They are our "family" birds. Now that i am going to be done with school, I now have the time to dedicate to the parrot i have wanted my whole life! Here is the problem and where you come in. I don't expect anyone to know any breeders in my area of course but if you could give me some ideas on where to start looking, that would be awesome. The internet has for once in my life turned me in circles! I have thought about finding a breeder out of state and shipping the bird to me, but i dont know how i feel about shipping an animal. Also, it makes "picking" the bird i want a bit difficult. If you haven't tried those already you should give them a call. If they don't have Senegals you should ask them if they know any other breeders that do. They may have connections or know somebody. I heard that Meyers are "out of season" as are many other birds right now. Don't rush it. Better to wait till their in season and get a good one then to rush the decision and jump into a buy. Don't let my videos make you decide you want a parrot. Some people seem to expect it to come like that out of the box which is not at all what I am trying to demonstrate but rather just trying to show the potential they have with proper training. They can have a nasty side to them, bite, and be a one person bird. So make sure you read up on all the flaws and problems. Are you planning to fly it? How experienced are you with flighted parrots? If you aren't then you probably should get a clipped one because going right to flight may be too big a step. 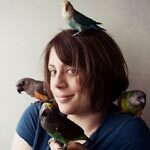 I'm going to experiment with a never clipped bird next time I get one and will try to make a tutorial for new parrot owners buying never-clipped parrots. If the breeders listed above just don't work for you, I'd recommend broadening your radius to one day's drive (so maybe 300 miles?). If you are really serious about getting a parrot and you find a perfect breeder or store for you at some distance, I think a long drive would be less stressful for the bird then to be shipped in. Just make sure not to draft it in the car by keeping temperature even and no AC. Any other questions? Welcome to the forum. Ya, i am well aware of their bad behavior. I have been considering many many birds and they just are my favorite by far. Your vid's were just entertaining, I have no expectations in training. There are other birds that are much more inclined to be trained. As for flight, I am not comfortable having a flighted bird and intend to clip its wings. I will give those numbers a call and see what they can say! So i went to my local pet store. They hand feed their birds behind glass windows at the back of the store, its very cool. Anyway, I went back to see what birds they have, and they are currently hand feeding 2 Meyers and 1 Senegal!!! Now i have to find 450 dollars for the bird, plus a cage, toys etc. hehe... ya not gonna happen. But i talked to the people there and they said they get a lot of birds in this time of year as well as in the spring. So I am gonna be patient, and start saving my money. Keep in mind that the price of the bird itself is very small compared to the cost of keeping and maintaining it. If you can barely afford the price of the bird, you can't afford to keep it. You must consider the long term costs of having a parrot. 450 on a bird, a couple hundred for a cage, 150 dollars for toys, food, etc. thats 800 dollars dude. The fact that I do not have 800 dollars sitting around that I can spend on a bird does not mean that i cannot afford the upkeep, and long lasting expenses of one. Thats like saying "If you can barely afford the price of the car, you can't afford to keep it. Cmon, dont you know you have to pay for gas, insurance, upkeep, repairs etc." Many, if not most, people faced with an expensive purchase that is not essential to their physical or mental well being, have to save up for it. If you walked into a pet store with no plan on buying anything, saw your Senegal, and then slapped down all the money for it, then you are a lucky person. The rest of us have to work for what we desire in life. Don't get me wrong, I understand the point you are trying to make, but I am not stupid, and I am not a child. I have the ability to research how much a bird costs and determine myself if i can afford it. I do not plan on getting a bird, then neglecting it, or getting rid of it because i cannot afford to care for it. Do not bother replying I will not be back to the forum to read it. For future reference, try to be more polite to new people and your forum may just become a great place to visit. I was always of the opinion that immature people should not own a parrot. I rest my case. Michael wrote: Keep in mind that the price of the bird itself is very small compared to the cost of keeping and maintaining it. If you can barely afford the price of the bird, you can't afford to keep it. You must consider the long term costs of having a parrot. I have to say I completely agree with TreF's reply to the above comment. I could barely afford the price of my bird, and I'm more than capable of being able to afford to keep him even though I did not have the cash for the initial cost burning a hole in my pocket. Think, an Amazon is $1,500, the cage I bought that was large enough was on sale at over $800, plus countless toys, perches, food, etc. I had absolutely nowhere near almost $2,500-$3,000 just laying around. I had to save up while I was researching and while I was waiting for my new baby to be old enough to be shipped to me. And even after all of that time I still did not have the whole amount saved up. That in no way means that I haven't been able to afford to keep him and provide the best care possible for him. TreF wrote: hehe... ya not gonna happen. But i talked to the people there and they said they get a lot of birds in this time of year as well as in the spring. So I am gonna be patient, and start saving my money. I think that saying that TreF was going to wait and start saving until he had the funds was completely responsible AND mature. Being irrisponsible and immature would be saying 'I want' and just going out and getting the first thing they saw at the pet store without even considering what size of cage they needed or even what type of bird they were getting. I also found that TreF was showing that he was reasonable. He's willing to save money before making the purchase. Yes birds are expensive to upkeep, however the initial cost tends to be even more, since it involves the bird, a cage and other accessories. Eventually, the costs are spread out and much more easier to manage, unless you face an emergency and must do extensive tests at the vet's office. And I'm sure that once he would have his bird, he would also start some type of emergency vet fund or at least save money in case something were to happen. Notice the words I used like "Keep in mind" and "You must consider the long term costs of having a parrot."